Hey again! My wife and I had this in a restaurant recently and it was fabulous. 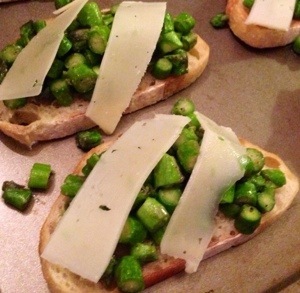 I know asparagus is usually a spring vegetable, but it looked really good in the store this weekend so I decided to make an attempt to recreate it. 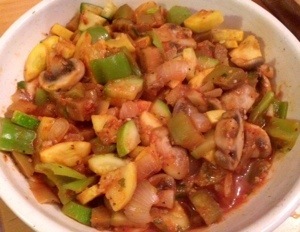 I think mine came out a little zestier, but you can adjust the amount of garlic and pepper to your taste. Either way, this is a quick appetizer or hors d’oeuvre nice enough for a dinner party or just as a side dish for a weeknight dinner. Warm up the broiler while you lay out the bread on a baking sheet. 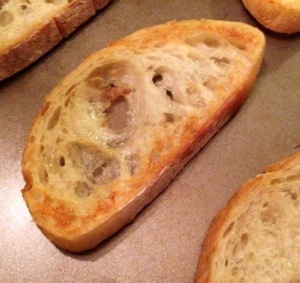 Brush the bread with the tablespoon of olive oil and place under the broiler for just a couple minutes – the bread should just start to brown but not fully toast. Take the bread out of the oven but leave it on the baking sheet. In a large skillet, melt the teaspoon of butter with the olive oil. If you’re using a garlic clove push it through a garlic press or chop as finely as you can. 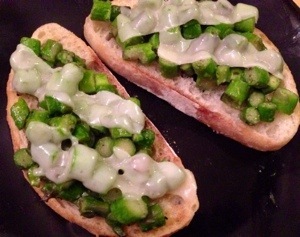 Add the asparagus, salt, garlic and black pepper to the pan and sauté for just 2-3 minutes – keep it crisp. 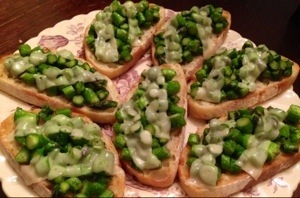 Divide the asparagus evenly over the bread slices. 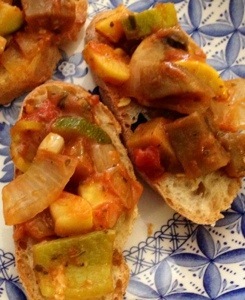 Slice the parmesan cheese off the block with a vegetable peeler and top each bruschetta with a couple pieces. 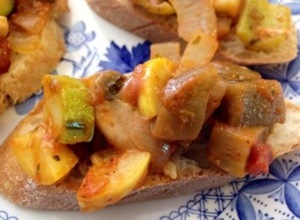 Return the bruschetta to the oven and broil for just 1 minute to melt the cheese. Serve immediately. I hope you give this a try and love it as much as my family does! Hey there! Fall is definitely taking hold here in Connecticut, but the soup pots are warming up in my house. This is a hearty cold-weather soup – a hot bowl with a good hunk of bread can definitely be made into meal. I really love the flavors in this soup, too. I’m looking forward to my lunches this week already! For the sausage, if your links are large in diameter, slice them lengthwise first before chopping into about 1/8″ thick slices. 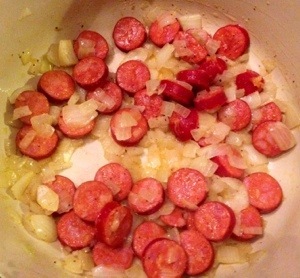 I used a linguica this time, but you could use an Italian sausage, a chicken sausage, or a chorizo, too. 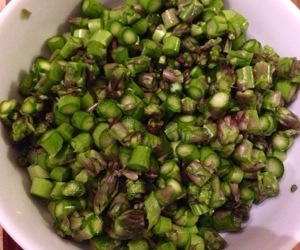 Melt the butter with the olive in a large soup pot. 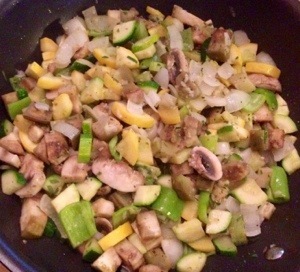 Add the onion and sauté for a minute or two before adding the sausage. Add some black pepper and garlic powder and sauté for another 5 minutes or so. Add the beans and chicken broth, stir to mix in the bean starch, then simmer for at least 10 minutes or so. Add the kale and stir it in gradually while it wilts. 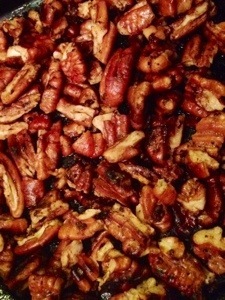 Give it a taste for seasoning and add some pepper or other spice if you like some heat. 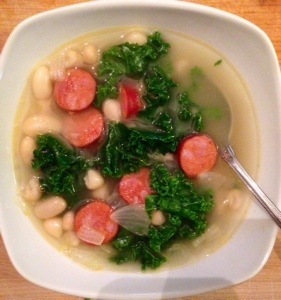 This soup will look and taste best if served immediately – the kale will stay bright green and crispy. Alternatively, if you need to make it ahead, omit the kale until you reheat it for serving. 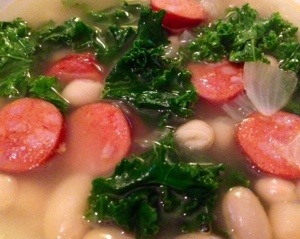 I hope you give this soup a try; with different types of sausages and different greens, you can change things up all winter long! 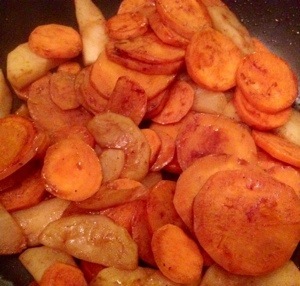 Paleo variation: omit the beans or substitute carrots or another vegetable. I have to confess, I’m not very adventurous when it comes to fish. 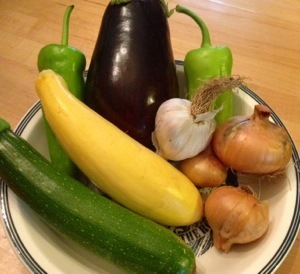 There are only a few varieties I cook regularly. 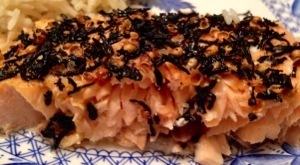 Salmon, however, is one I absolutely love and thankfully my kids love it, too. My wife picked up a Salmon Tea Rub in a spice store in Newport, RI a while back and we decided to try it out. You can check it out here, but it would definitely be easy to make up a similar version on your own with some loose-leaf black tea. 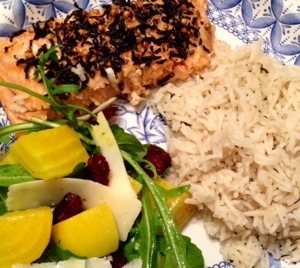 I served the salmon with the Golden Beet and Arugula Salad I posted the other day. Great combination! If preparing the tea rub on your own, combine the tea and the salt in a small bowl. Put the peppercorns and coriander seeds in a Ziploc bag with as little air as possible. Crack the seeds roughly with a meat mallet or other “blunt instrument”. Add this mixture to the tea and salt and stir to combine. Lay the salmon out skin side down in a large baking pan and brush with olive oil. 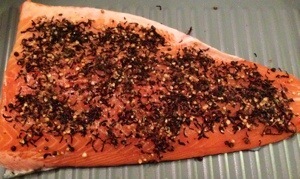 Coat evenly with the tea rub and press the rub into the fish with the back of a spoon. Bake for 15-20 minutes, until your desired doneness. Some basmati rice with thyme and a salad makes for a really good combination and a great healthy meal! 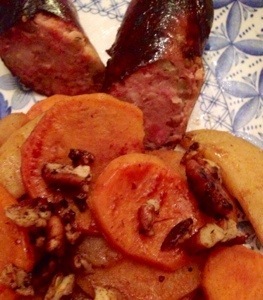 Wine pairing – go with a nice Pinot Noir for this dish. Hi, it’s Ginny again! 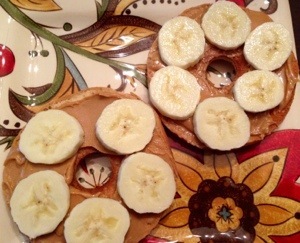 Check out my new post on Kid’s Corner – Peanut Butter Banana Bagels! Hi everyone! I have a great salad recipe today. 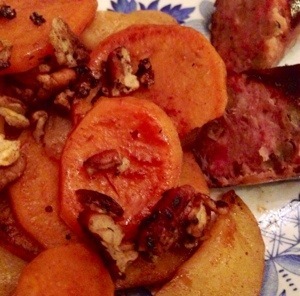 Beets are becoming one of my favorite fall vegetables and I’m trying to find new fun ways to use them. This salad is topped with golden beets, but you could certainly use the red ones. I like the crisp texture they give a dish like this, and the color is just great, too. 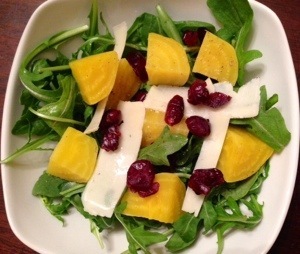 The earthiness of the beets mixed with the peppery taste of the arugula and the tartness of the cranberries gives this simple salad a great complex flavor. We had this salad with a delicious salmon recipe which will be coming to Dad vs. Dinner soon! Peel the beets and chop into about 8 pieces or 3/4″ chunks if your beets are larger. Steam for about 8-10 minutes, then remove from the heat and set aside to cool a bit. Fill 4 salad bowls with the arugula. 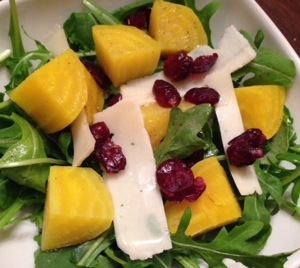 Top each with 1/4 of the beets, then shave 4-5 pieces of the parmesan with a peeler over each salad. Sprinkle the cranberries over next, then season with salt and pepper, as desired. Drizzle with olive oil and a nice white balsamic vinegar – keep it simple so you don’t overpower the flavors of the other ingredients. Of course, you could do this as one large salad and serve family style, too. Hope you give it a try. Let me know what you think in the comments!